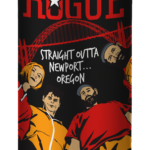 Straight Outta Newport… – Louis Glunz Beer Inc.
Bursting with Citra, Mosaic, and Comet hops, Straight Outta Newport packs a wallop of citrus aromas and fruit flavors to create a beer unlike any other we’ve ever brewed. We set out to brew a huge West Coast IPA which would repeatedly and increasingly satisfy the thirstiest hop heads. Enjoy… enjoy… and enjoy again.